Frederick Sykes Parker was born in Newburgh, New York, U.S.A. in 1890, the son of Ossett-born bricklayer John Sykes Parker and his wife, Sarah (nee Goodwin) who was born in Buxton, Derbyshire. They were married at South Ossett Christ Church on the 5th August 1883 and had six children from their marriage, but three of the children died before April 1911. John Sykes Parker appears to have been known by the name Sykes Parker. In 1891, Sarah Parker and her three children, Sylvia, Fred and George, were visitors at the home of George and Ellen Wood, 14, Horbury Road, Ossett. Sylvia Parker was then aged 4 years, born and baptised in Hemsworth in September 1886; Frederick Parker was aged one-year and George Arthur Parker was one-month old, born on 17th February 1891 and baptised at South Ossett Christ Church on the 22nd March 1891. This suggests that the family had gone to the U.S.A. no earlier than late 1886 and returned in late 1890. Fred's father, Sykes Parker was a gardener. There is no sign in 1891 of a (John) Sykes Parker and he may have remained in the U.S.A. at the time that Sarah and her children returned to the U.K. There is a record of a Sykes Parker arriving in Liverpool from New York on the 28th June 1898, aboard the Majestic passenger ship and this is most likely Fred's father. In 1901 Sykes and Sarah Parker had moved to Barrow-in-Furness with their three children. By 1911, John Sykes Parker, Sarah and two of their children, Fred, aged 21, and George Arthur, aged 20, had moved back to Ossett and were living at Healey Road. Fred was working as a bricklayer like his father. The Parker family later moved to Radley Street, The Green, Ossett. Frederick Sykes Parker’s army service record has not survived, but it is known that he enlisted at Ossett, and subsequently joined the 9th Battalion of the King’s Own Yorkshire Light Infantry with the service number 200217. He also had an earlier service number of 1871, also in KOYLI, which suggests he was in the Reserve or the Territorials prior to the declaration of war in August 1914. He embarked for France on 13th April 1915 and was killed on 24th August 1918. They marched across France and went straight into action in reserve of the British assault at Loos on the 26th of September, suffering heavy casualties. In 1916 they were in action in the Battles of The Somme, including The Battle of Morval in which the Division captured Geudecourt. In 1917 they were in action during The German retreat to the Hindenburg Line, the Arras offensive, the Third Battles of Ypres and The Cambrai Operations. In 1918 they fought on The Somme then moved north and were in action during the Battles of the Lys, the Battle of the Aisne, The Somme, the Battles of the Hindenburg Line and the Final Advance in Picardy. At the Armistice the Division were around Berlaimont, on the 12th they moved to Beaufort, then in mid December they moved west of Amiens and demobilisation began being completed by the 19th of May 1919. Private Frederick S. Parker was posthumously awarded the British and Victory medals, and also the 1914/15 Star, to acknowledge his service before the 31st December 1915. "The left attacking Battalion was the 1st East Yorkshire Regiment, and the right attacking Battalion was the 9th K.O.Y.L.I. The Brigade Reserve was the 15th D.L.I., who formed up about 300 yards in rear of the front Battalions. An artillery barrage had been arranged, but alterations in plan cancelled this. About the time of the attack, 11.30 p.m., a few shells were fired, but they did not have much effect. The 9th K.O.Y.L.I. dealt with the dug-outs in the ravines running out of Battery Valley over the side of the hill, and then formed up for the next advance. The Support and Reserve Company 1st East Yorkshire Regiment were sent to mop up the village of Grandcourt, which they quickly overran, capturing four field guns, 20 machine guns, and over 100 prisoners, About 1 a.m. a further advance was made by the remainder of the 1st E. Yorkshire Regiment and the 9th K.O.Y.L.I., and after advancing about three-quarters of a mile attacked across Boom Ravine, where little resistance was met. As dawn was breaking on the morning of the 24th August, the Durham's and the 9th K.O.Y.L.I. advanced in small parties up the hill, but here it was evident that we were up against resistance once more, but our task was accomplished. The enemy rearguards opened out an annihilating machine gun fire, and the Brigade was hurried into a position of all-round defence, for it was evident that the Brigade (or such portion as was on the hill was surrounded, but intact, in the enemy position. The men held shell holes, and dare not stand up. The enemy made several small counter-attacks, but at great cost in lives to himself. About 10.30 a.m. Capt. Spicer, the Brigade Major, after an affair with a German sentry, managed to get away, passed Grandcourt and informed the 1st E. Yorkshire Regiment of the position, found a horse and rode to 21st Division Advanced H.Q. at Mailly-Maillet, where he explained the situation. The report was confirmed by aeroplane reconnaissance. These 'planes dropped messages on our little hill promising speedy assistance. The Brigade was in a rough circle round the hill, but in no formation as regards units. During the enemy shelling early in the morning the Brigade suffered far more heavily than in the attack. At noon on the 24th August there was a sudden quiet; the sun had got up and was very hot, the mists had lifted from the river below and dissipated, and away to the north the advanced troops could be seen advancing on Miraumont. The 64th Brigade had some cause (or self-congratulation, having fought its own bridgehead positions, crossed the Ancre, and on a pitch dark night advanced from 21/2 to 3 miles to their allotted objective over craters and shell-hole country, and holding that objective in the face of determined outflanking enemy, until relieved some 15 hours afterwards. In spite of all, casualties were light." 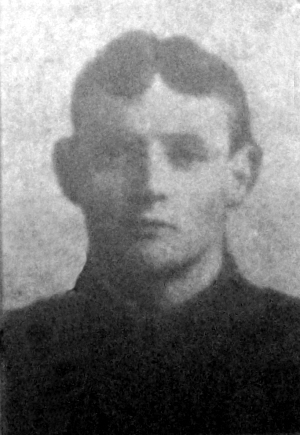 "Gassed, Wounded Three Times, Now Killed - Another well-known local soldier, Private Fred Sykes Parker (30), K.O.Y.L.I., whose home is in Radley-street, off the Green, Ossett, has made the supreme sacrifice after strenuous service in the war. He is the son of Private Sykes Parker, who since the early days of the war has been serving with the National Reserves in different capacities of home service. Fred was camping with the local Territorials at Whitby when war was declared, and being mobilised, forthwith has served with the army ever since. In operations with the enemy he has been once gassed and wounded three times, on one occasion so seriously that his mother was sent for and visited him in hospital in France. His brother George, after serving with the Royal Field Artillery, has been discharged from the army disabled." Private Fred Sykes Parker, aged 29 years, son of Sykes Parker, of 17, Radley Street, The Green, Ossett, died on the 24th August 1918. He is remembered on Panel 8 of the Vis-en-Artois Memorial, 4 Pas de Calais, France. Vis-en-Artois and Haucourt are villages on the straight main road from Arras to Cambrai about 10 kilometres south-east of Arras. The Memorial is the back drop to the Vis-en-Artois British Cemetery, which is west of Haucourt on the north side of the main road. 2. Adapted from "An account of the 23/24th August" by Lieutenant S. W. Howard, M.C. of the East Yorkshire Regiment.